The Freeze Inventory application allows the user to freeze inventory levels as of a certain date usually the end of the period. This allows the company to continue doing business while still being able to go back and analyze inventory levels and values as of the freeze date. If on-line transaction processing is being used, frozen inventory levels will not be updated when new transactions are entered. The Frozen Stock Status Report allows the user to print out information about inventory as of the freeze date. * Select the desired mode from the Freeze Inventory menu bar. 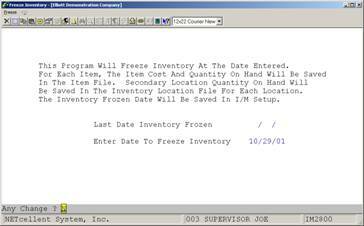 This Program Will Freeze Inventory At The Date Entered. For Each Item, The Item Cost And Quantity On Hand Will Be Saved In The Item File. Secondary Location Quantity On Hand Will Be Saved In The Inventory Location File For Each Location. The Inventory Frozen Date Will Be Saved In I/M Setup. A date in the standard format. The last date at which inventory levels were frozen is automatically displayed. If the application has not been run before, this field will display as 00/00/00. Enter the date at which inventory is to be frozen.